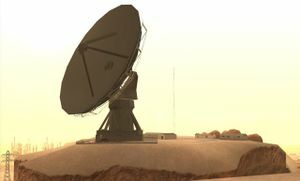 The Big Ear is a large radio telescope located in Bone County, San Andreas. 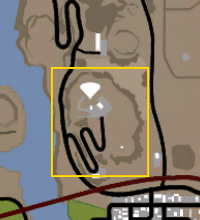 This enormous structure is a prominent feature of the surrounding desert landscape, and can be seen from miles around. Its emissions are no less gargantuan, apparently powerful enough to cause local children to be born without ears. Planes will sometimes crash into the satellite dish, and one of Carl Johnson's girlfriends, Barbara Schternvart, will sometimes comment about a plane crash there. It is a parody of the radio astronomy observatory dishes that form the Very Large Array in San Agustin, New Mexico, there is only one dish however. The Big Ear shares its name with a SETI project from Ohio State University that was designed to search for extraterrestrial radio transmissions. Sandking - Under the antenna dish, to the northern part of the platform.